York Community Energy grew out of York in Transition – a network of individuals and organisations who aim to encourage community-led action to deal with the twin challenges of peak oil and climate change, part of the international Transition movement. 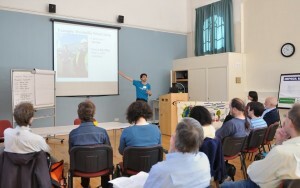 In April 2011 York in Transition organised a conference on Community Energy projects. Various possibilities were discussed and groups were formed to research the feasibility of different schemes. One such group grew into York Community Energy. One extremely useful resource for this research was the report commissioned by the Council from consultants AEA in 2010, “Renewable energy: Strategic viability study for York”. This examined York’s potential for renewable energy generation from all sources, and made an assessment of the viability of different options. Its conclusion was that large or medium wind energy projects represent the most viable options. The report also gave some (rather approximate) locations for potential wind turbines sites in York. We began to examine these sites and collate other data, such as the Experian’s GreenAware attitudinal data (helpfully provided by the Stockholm Environment Institute), demographic data from the census, and ‘sieve maps’ showing sensitive areas. We were fortunate at this point to gain the support of Origin Energy – a Community Interest Company based in York who have offered us free technical advice and the benefit of their experience. We initially began by identifying a viable site in the parish of Murton, and began canvassing the opinions of local residents. Initial responses were very positive and we identified a landowner who would provide a site. However by Spring 2014 it had become clear that the support we found was too passive to progress the scheme in a true community ownership model. Without active support from the immediate locality it would not be possible to promote and manage the scheme successfully. Wind turbines are controversial and there is much misinformation about them in the public domain. We therefore decided not to progress with any further work on this site, but to refocus on tackling this misinformation whilst investigating other schemes. At our AGM in 2015, a discussion amongst the members resulted in a decision to pursue collectively-owned solar installations (as in Edinburgh and Sheffield) as our next project. Shortly afterwards, this decision was cemented by national policy changes which effectively put a stop to all new onshore wind projects (see our blog entry for more detail). We still maintain a long-term aspiration to install a wind turbine in the City of York area as and when the national policy situation becomes more favourable to them. The decision on where this could happen will be made based on the presence of local support.